Location: Sather Rd. and Bancroft Way, U.C. Berkeley, Berkeley, Calif.
After meeting each other at Merritt College and establishing the Black Panther Party in 1966, Huey P. Newton and Bobby Seale took to the streets to raise money for the organization. Firm believers in the teachings of Chairman Mao and the use of unconcealed weapons as a means of protecting the black community, Newton and Seale aimed to educate others and raise money for weapons by selling his Little Red Book. In 1967, they found an untapped resource: University of California, Berkeley students. Newton and Seale could be seen selling the book at Sproul Plaza to support their cause. 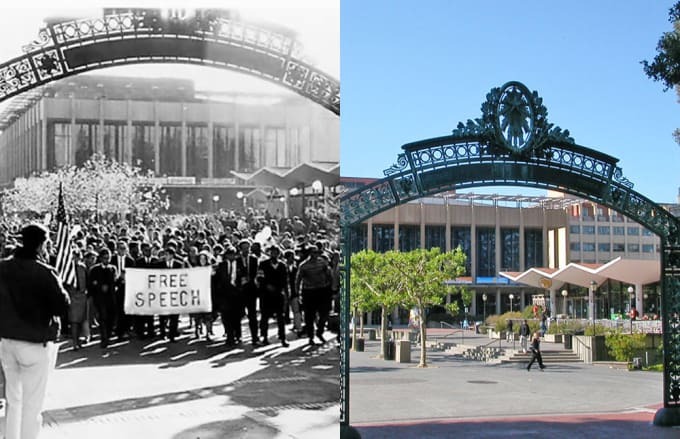 As the school's primary area for student activity, Sproul Plaza has a deep history of activism. Protests against the school's investment in apartheid-era South Africa took place in Sproul. And let's not forget that it also serves as the site for Occupy Berkeley.